Now Available: The Ultimate Fedora T-Shirt! 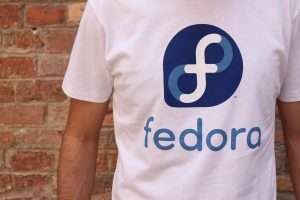 If you’ve been involved in free and open source projects like Fedora for very long, you know one of the most sought-after “swag” items is a t-shirt with your projects’ logo. Until now, the easiest way to get a Fedora T-shirt has been to go to a big event like Flock, or through events organized & supported by our Fedora Ambassadors around the world. 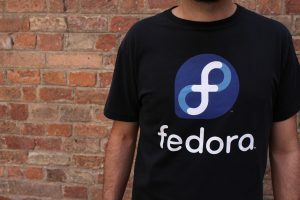 This month, our friends over at Unixstickers.com released the “Ultimate Fedora T-shirt” in their online store. Since they ship to most countries around the world, you can now get your hands on a Fedora t-shirt even if you’ve missed one of our events! The shirts are heavy-duty “classic fit” style in a variety of sizes, and are available in black and white with the Fedora logo screen printed on the front. And even better, as a bonus with your t-shirt order, they’ll throw in one of the cool Fedora stickers they also sell for your laptop or other device at no extra charge! One of the great things about Unixstickers is their financial support of all the different awesome projects in their store. With every Fedora t-shirt order, a portion of your purchase is donated back to those projects and to other charities. So what are you waiting for? Head over & pick up a shirt or two today! UPDATE: Unixstickers.com has announced a fitted style t-shirt to their Fedora lineup, so check it out before you order! Make a sleeveless “V”-Neck version. I live in the Philippines and wish to have one to run in. Like Richard above you could also try to put a request in for a different style at https://trello.com/b/WcWf6kdF/unixstickers-public-roadmap. And who knows, there might be more Fedora swag available from different places further down the line! but this one looks good as well. Well,,, i would like you guys to make a T-shirt with collar! the round neck is cliche! i live in India and i’m sure a T-shirt with collar would certainly impress the old fedora fraternity here!